I went in for my appointment yesterday, not expecting to do much more than pee in a cup and hear the baby's heartbeat. With Bubbers, my OB only did one ultrasound at 20 weeks to check for important measurements and gender. 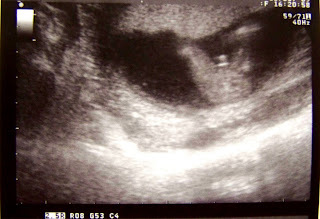 I did get an unexpected one at 13 weeks to check for multiples (I was measuring large and being a twin myself, there was a little bit of concern there), but Bubbers looked kind of like an alien and there was no way of telling the gender at that point, anyway. Yesterday, however, the doctor informed me he would be doing an ultrasound. Exciting! I always love to take a peek at the baby. Since I am only at 15 weeks, though, I figured we wouldn't be able to see much -- just a flickering heartbeat and a general outline of a baby. I was wrong! As soon as the image came up, I saw the baby's brain, skeleton, ribs, spine, heart ... wow! The doctor then asked if I was planning to find out what we're having. I said yes, of course. Then he said, "We usually don't check gender until next month, but we might be able to see it today if we look ..."
So, he moved the ultrasound wand to the other side of my belly, and I instantly began to giggle. Not very modest, are we? Yes, we're having a BOY! 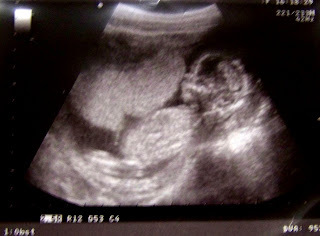 I kind of already knew, based on my intuition and the fact this pregnancy has been so wildly different than last time. It was fun to see for myself, though. Dill is understandably thrilled. I am excited too, and a little nervous about raising a boy. But it will be fun to try something new! Next month, we'll have a more thorough ultrasound to confirm this and get some measurements on the baby's organs and such. I'll have some better pictures then, I'm sure. Hooray!!!! May I be the first to e-congratulate you! That's so exciting. Now you know you will at least have one of each. *whew* You could technically stop after this one and produce a perfect family. But you better not because your children are too beautiful and we need more beautiful Footes in the world. Congratulations! And yay for the headaches being gone! YAY Jenna! I'm excited for you. I have a girl/boy combo and its awesome. Congrats!